Comments on "Democracy: an existential threat?" Comments in response to comments on Ali Abunimah and Omar Barghouti's story, "Democracy: an existential threat?" in the Guardian's Comment is Free today. "Just one question to the authors. And to all the other noble people who 'cannot understand' why this solution [one state] is not going to work. I am a Jewish Israeli. What will happen if I now go to Ramalla for a private visit ? I want a straightforward and honest answer." My late father, Baseel, was born in Ramallah in 1922. Until 1948, Ramallah was almost one hundred percent Christian. Its original inhabitants migrated to Ramallah from east of the Jordan River in the sixteenth century and we are all related; the American Federation of Ramallah, Palestine is the largest Arab-American organization in the US. Today it is about fifty percent Christian and its mayor is Janet Michael, a Christian Palestinian. I believe that the mayor must be Christian. It pains me very much that Ramallah, which because of its mild climate was a well-known vacation resort before the Nakba, is almost exclusively associated with the lynching that occurred there. Not to excuse it; I remember my father condemning it, but it was believed by some of the Palestinians there that the two belonged to the IDF death squads that frequent Palestinian towns and extrajudicially kill Palestinian young men. If you came to Ramallah in peace you would be treated well and with typical Palestinian hospitality. There are any number of Israeli peace activists who would attest to this. My father recalls before the Nakba playing bridge with Jews in Ramallah. And the man who visited my father most frequently when he was dying of cancer was Sa'eb Dajani, a Muslim from Jerusalem. It saddens me to see Palestinians demonised on these I/P boards. We are not all the same, but a diverse group of people. I definitely agree with all those who noted here that articles advocating the so-called "one-state solution" seem to become a regular fixture on CIF; and indeed, much of what can be said about this "solution" has been said. All the talk about "democracy" and "equality" cannot obscure that the project is about one thing, and one thing only: to do away with Israel and to turn the Jews who would be willing to stay and risk finding themselves ruled by Hamas into a minority. Of course, the fate of Israel's Jewish citizens is of no interest to the one-staters; their, in principle legitimate, concern is about the Palestinians, and they claim that their approach is "rights-based". But the core right they really claim for the Palestinians is the right to forego the right to self-determination in a state of their own in favor of the "right" to demand the dissolution of an existing state, thus also denying the vast majority of the population of this to-be-dissolved state the right to self-determination. Essentially, this objective is to be achieved not so much by democracy, but rather by demography. Another crucial premise of this "rights-based" approach is the notion that the "right" to claim a specific place of residence is more important than all other rights, and trumps the rights of the current residents in this specific location. Since indeed every official Palestinian document emphasizes that the Palestinians are an integral part of the "Arab nation", the logical conclusion then would seem to be, as Armaros has already noted, that the Palestinians should pursue the goal of becoming part of Jordan, which already has a Palestinian majority. That is the "one-state solution" of which the Israeli right is dreaming, and they argue for it in terms that are stunningly similar to many of the arguments presented by people like Abunimah and Barghouti, who, BTW, having studied in Tel Aviv, is probably an Israeli citizen. The other fascinating thing about the "one-state" campaign is that it produces article after article penned by activists who merrily confirm what Israelis (particularly on the right) have been saying for decades: "The main Palestinian impetus after [...] 1948 was that of 'return'; it was more about reversing the loss of Arab land and patrimony, than the fulfillment of classical post-colonial self-determination, via statehood. [..]It was only after [...1967] that a new Palestinian national identity began to take shape. At its core was the notion of the armed struggle as a galvanizing force. Armed struggle, according to Fatah, restored Palestinian dignity and gave the Palestinians a say in determining their future. Statehood and state building had no real place in this scheme. Indeed, the first tentative proposals to establish a state [...] were rejected as defeatist and a betrayal of the national cause." Petra, you have a lot to say in defiance of Article 13, Section 2, of the Universal Declaration of Human Rights: Everyone has the right to leave any country, including his own, and to return to his country. So tell me why you, an immigrant from Germany, have more right to live in, let's say Jaffa, than my friends from Jaffa, who were born there, and whose families lived their there for hundreds of years, and who are now in forced exile? Would you really find it so unpleasant to live next door to one of my friends from Jaffa, a rather well known Palestinian artist? "[I] have no objection, in fact I'm very glad that Yossi Beilin and his family and his ancestors live in the country. They're there, the compromise is that they live there with us together in peace. The thing I can't understand is why he finds it so horrifying that my mother should live in the country with him, that's the thing I can't understand." The deleterious effects of the Nakba (Arabic for the Catastrophe of 1948; however, increasingly referred to as an ongoing process to rid Palestine of its inhabitants) will ultimately be reversed. "Palestinians cannot simply continue to look across the barbed wire and see their homes occupied by Russians and Ethiopians while they rot in refugee camps. They must return home. This is in the Israelis' best interest in the long run. This is in the long-term interest of the US. This is in the interest of peace and stability in the Middle East. This is what the whole world has affirmed year after year since 1948." According to the CIA's World Factbook the median age in Gaza is 16; 47.6 percent of the population is fourteen years old or under. Of its 1,482,405 population, 993,818 are refugees. Collective punishment, such as what Gaza's children face, is illegal under international law. 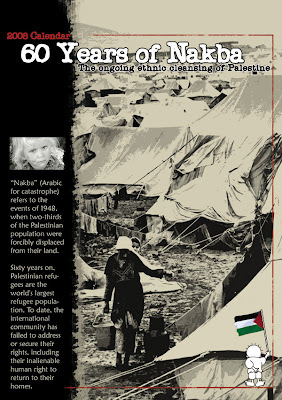 The collective punishment along with a host of other depradations inflicted upon Palestinians is evidence that the Palestinian Nakba (Catastrophe) did not end in 1948. Oft quoted comments from Zionist leaders attest to the fact that Zionists always wanted the land without its inhabitants. Israeli leaders hoped to wipe out the Palestinian collective memory as evidenced by its destruction of hundreds of Palestinian villages; one small example, Sderot built upon the defaced Palestinian village of Najd. My five children, born in Okinawa, the Philippines, and mainland Japan, wear their Palestine '48 hoodies proudly this Christmas. They, contrary to the statements of those on these boards who dehumanise us, are not inculated with hate, but with pride in their roots, which are in Palestine. "Even among the youth that has never seen Palestine, the prospect of return remains a sacred goal. 'If I were able to go back to Palestine, I would go immediately,' said Arwa Saleh, a 25-year-old Palestinian journalist living in Cairo. 'Why would I give up my right? I can't imagine that anyone would.'" The campaign against Lev Leviev's "conflict" diamonds garners publicity in the New York Post and two Palestinian activists, Mohammed Khatib for Bil’in’s Popular Committee Against the Wall and Settlements and Sharif Omar for Jayyous’ Land Defense Committee have appealed to Susan Sarandon, who showed up for Leviev's opening for the New York store, to reconsider her support for the man engaged in the international crime of building Jews-only settlements on occupied Palestinian land. "The olive is a symbol of our land and of the Palestinian people. We are connected to the land. We were born in Bil'in like our fathers and grandfathers and their fathers. We belong here. Our mothers took us to harvest olives before we could speak. We remember playing under the olive trees which have since been uprooted by Israeli settlers who have come to live here. There is now a huge and growing settlement called Modi’in Illit where we played as children. It is hard for us to understand that our children cannot play in the same places where we played." 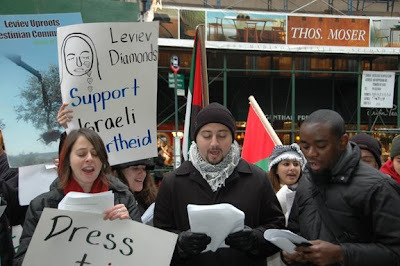 Join Adalah-NY and the Palestine Liberation Singing Troupe for nondenominational holiday caroling outside of Israeli diamond and settlement mogul Lev Leviev's NYC storefront. The tunes are familiar, but the words have been tweaked to highlight the destruction of communities that Leviev sponsors in Palestine , New York and Africa , and the profits Leviev makes from human rights abuses. How have things in Gaza changed over the past 12 months? Sadly, there are no rosy reflections to be found here. Things were bad in Gaza this year. Very bad. Whether looked at from a political or purely humanitarian perspective, it's difficult to see the upside where there is such an orchestrated global drive to maintain the status quo: smother until surrender. The health indicators are telling: about a quarter of essential drugs and a third of essential medical supplies were unavailable in the Gaza Strip in October 2007. Less than half of Gaza's food import needs are currently being met. Fuel reserves are almost at zero after punitive cuts by the Israeli government began last month. And with diesel-run water-pumps unable to function, tens of thousands of Gazans are without access to fresh drinking water. Everything considered "non-essential" has disappeared from supermarket shelves (including chocolates, as one friend half-jokingly lamented). It is as though depriving a nation of medicines and fuel and freedom of movement and sanity will somehow make them turn against their rulers. And as though providing them with a trickle of "essential" supplies every few weeks is going to exonerate those imposing and supporting the siege. Or sustain the besieged just enough so that they don't wither and die; because somehow, the onus is on them to undo all of this, and they need all the energy they can get. Gaza's isolation has also come full circle this year. Travelling in and out of the occupied coastal territory has always been an exercise in the impossible, but now, it's no longer an option that can even be exercised, in whatever degree of difficulty. Thanks Guardian for publishing Laila, an articulate voice representative of many Palestinians, and I include myself, a Palestinian Christian. I only mention my religion for those on these boards who play up divisions between Christian and Muslim Palestinians, Hamas and Fatah Palestinians, Diaspora, West Bank, Gaza, and 48 Palestinians (Palestinians in Israel). The Israeli government while abetting divisions, in reality makes no such distinction even managing to "steal Christmas" this year, prohibiting Father Seres Kalkhlisat to return to Ramallah from Jordan. "The Our Lady of Annunciation Catholic church in the West Bank city of Ramallah cancelled its Christmas celebrations completely, because the priest, Jordanian national Seres Lalkhlisat, could not return to the West Bank from Jordan, where he went to visit his family." When it gets right down to it, "We're all Palestinians," so poignantly related by this young Palestinian-American in "Blind Israeli Injustice," a story which renders in heartbreaking details the humiliation meted out to those of us who wish to visit the place of our roots. So refreshing to have a Palestinian voice speaking on behalf of Palestinians here and calling for one state. I really don't know why it's such a horrifying thought for the young immigrants from London and Germany to live next door to our mothers and fathers, now in forced exile from the place of their birth. This story reminded me of my Christmas vacation thirty-four years ago in Palestine and the Israelis attempts to ruin my time in Palestine. The young woman here renders with heartbreaking concrete details the humiliation those of Palestinian ethnicity endure from the Zionist immigrants from all over the world when we visit our relatives in Palestine. First read at Annie's Letters and posted originally at Kabobfest. Two hours pass-It could be worse, I think. At least I’m not feeling the vicarious shame of watching my mother being strip searched like the several other previous times at the Israeli border. In line to check our bags through security, I make small talk with the young Palestinian man standing in front of me with his Israeli passport in hand. We speak in Arabic and he tells me he’s from Haifa and was just visiting relatives in Amman. He asks me if I’m also originally Palestinian and I tell him yes, but born and raised in the states. Smirking, he replies, “in the end we’re all just simply Palestinians.” I smile, yet soon enough I’d see exactly what his words imply. How long have you been studying altogether? Are you carrying any weapons now? Why have you come to Israel? Why have you come to Palestine? Why would you come here for a vacation? Why not somewhere nice, like California? Where will you stay in Israel? Ramallah. Who will you see there? My grandparents. They’re very old. Feels like a safe enough answer. What could be more benign than grandparents? They must hear that one frequently...No wait. I forgot that it’s our grandparents that possess one of the most formidable weapons: Memory. So why exactly do you come to Israel? I didn’t know there was a way to get from Amman to Ramallah without having to cross into your state. We don’t choose to pass through the occupier in order to get to the occupied, you know. I have a break from school, so I’m seeing family. For a moment, I pause to contemplate the face of the border soldier sitting before me. She can’t be any older than me, I think. I try to briefly strip her of her role and imagine her life beyond the uniform. I ponder how she spends her nights off, what novel most moved her, what she might affectionately call her lover. Yet such thoughts are all too fleeting and soon enough I resume my inability to see anything beyond the repressive establishment she represents.There’s a reason I shudder each time I see someone wearing army green and feel instantly defensive and inferior each time I hear an Israeli accent. You’re it. Consider this and future stories by Palestinian Christians and take with a huge grain of salt Zionist attempts to portray to the West a divide between Palestinian Christians and Muslims and their propaganda that it is Muslim persecution of Palestinian Christians responsible for the emigration of Christians from Palestine. 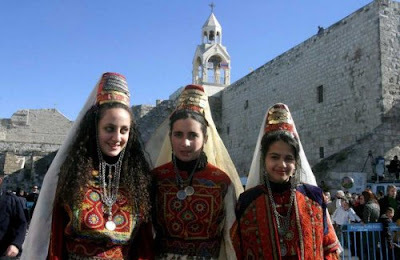 Bethlehem girls in traditional dress celebrate Christmas in Manger Square. Christmas is a season of good will. However, for Israel and its notoriously mendacious propaganda machine, Christmas is also a hasbara opportunity for spreading lies and disseminating disinformation and half truths about Christians in the Holy Land. The usual seasonal dosage of lies includes such claims that Christians in the Holy Land suffer more from Muslim persecution than from the Israeli and apartheid, and that Christian emigration is not really attributed to Israel’s Nazi-like repression of the Palestinian people but rather to Palestinian “Muslim” intolerance and violence. Well, such lies are not new. Israel itself is a state based on lies and lying has always been and continues to be Israel’s policy and modus operandi. In fact, it is very hard for one to be Zionist and not to be a liar. In truth, Zionism and mendacity are two sides of the same coin. Didn’t Zionism claim that Palestine was a land without a people for a people without a land? Didn’t Zionism claim that Palestinian refugees fled their homes and towns willingly and that Israel was in no way responsible for their flight? Didn’t Israel tell the world that the Israeli occupation army was the most moral army in the world, and that Israeli soldiers didn’t knowingly and deliberately kill Palestinian children and civilians, and that the numerous acts of murder and maiming by the Israeli army were merely regrettable accidents? And even now, and despite Israel’s nakedness before the peoples of the world, this shameless state and its professional liars and spin doctors continue to claim ad nauseam that Israel is a democratic state where the rule of law is supreme. Well, do democratic states act and behave the way Israel is acting and behaving? Do democratic states classify citizens and subjects into Ubermensch and untermensch? I know for sure that our Christian-Palestinian brothers and sisters shall never allow Israel to use them as hasbara pawns in the service of oppression, racism and ethnic cleansing. The Christians of Palestine, who have received their share of suffering and oppression at the hands of Zionism know more than anybody else that the wickedness of the occupation doesn’t distinguish between them and their Muslim compatriots. In November, 1948, the Hagana terrorists overran the two Christian villages of Ikrit and Birim in the upper Galilee, expelling inhabitants at gunpoint. The pogrom-like expulsion was carried out without the Israeli government approval. However, the democratic Israeli state never allowed the Christian inhabitants to return, despite several rulings to the contrary by the Israeli High Court. Since 1967, Israel, has been trying to play all kinds of dirty tactics to tamper with Palestinian national unity, especially by playing Muslim against Christian and vice versa. A few years ago, the Israeli Intelligence instructed its agents to throw stones and Molotov cocktails on several churches in the northern and central parts of the West Bank, apparently in order to use the incidents as hasbara ammunition in North America where public opinion was already overcharged against anything Arab or Islamic. Meanwhile, the Israeli media, especially right-wing newspapers such as the Jerusalem Post, was concocting and inventing stories about Christian girls being raped and murdered by Palestinians in Bethlehem. Such fabrications would be readily inflated, spun out of proportions and then widely disseminated especially among evangelical fundamentalists. Eventually, this would be translated into political support for Israeli colonialism and ethnic cleansing against both Muslims and Christians in the Holy Land. Of course, many innocent and often naïve Americans and Canadians have no idea what kind of treatment is being meted out to Christians in the West Bank at the hands of Israeli occupiers. They don’t know that Israel is systematically stealing, at gunpoint, Church property and real estate in Bethlehem, Beit Jala, Beit Sahur and Jerusalem. They don’t know that Israel routinely bars Christians, laymen and clergy, from accessing their holy places in Jerusalem, e.g. the Church of the Sepulcher. They don’t know that Israeli Jewish youths routinely harass, even spit on clergymen in the streets of Jerusalem, often in full view of policemen who in most cases remain passive. They don’t know that Christian commuters are routinely humiliated at roadblocks manned by trigger-happy soldiers, which make their daily lives an unending nightmare? They don’t know that Israel has already morphed Bethlehem into a ghetto thanks to this Wall of Shame which Israel calls “separation wall” when in reality it is designed to grab and steal as much Palestinian land as possible. Well, just come to Bethlehem and see for yourself. It is a nightmare, it is hell on earth, and it is done by a people who claim to be a light upon the nations. If Christians in North America knew how Israel is acting and behaving toward their fellow Christian coreligionists and, of course, toward other Palestinians, they probably would start to change their views. That is why it is imperative that Christians, especially in North America, make some serious efforts to know the truth about Israel and its crimes. This can be done through third-party sources such as human rights organizations and western groups operating in the West Bank such as the Christian Peace Making Team and the International Solidarity Movement. In short, Israeli and pro-Israeli media wouldn’t tell the truth about Israeli crimes against Palestinians, Muslim and Christian alike. So try to find alternative sources of news to know the truth about what is really happening in the Holy Land. Don’t allow yourself to be duped and enslaved by Zionist lies. Above are scenes from December 24, 2007, in Wiesbaden-Naurod, Germany. The modern style Holy Family was carved by a Palestinian Christian in Bethlehem, one of the original stones, a descendent of an early Christian family and bought by me, a Palestinian-American Christian living in Germany, with roots in Ramallah, Palestine. Sadly, like the two thousand year old olive trees, Zionist criminal thugs severed, Zionist depradations have led to the virtual eradication of Palestine's Christian presence. Before 1948, fifteen percent of Palestine's population was Christian. Today it's around one percent. Zionist led tours to Palestine's holy sites whisk tourists to and from Bethlehem, ensuring that no one spends the night in Bethlehem, and contributing to the economic decline of Palestinian proprieters. “Israeli society is reaching new heights of racism that damages freedom of expression and privacy,” said author Sami Michael, president of the association. According to the Hebrew press, the report’s key point includes a 26-percent rise in the number of racist incidents against Arabs and twice as many Jews reporting a feeling of hate toward Arabs. “We are a society under supervision under a democratic regime whose institutions are being undermined and which confers a different status to residents in the center of the country and in the periphery,” the Israeli newspaper Ha’aretz (9 December) quoted Michael as saying. Some of the most shocking but expected findings of the report include the following: As many as 55% of Israeli Jews support the idea that the state should “encourage” the Arab citizens of Israel to emigrate; up to 78 % of Jewish respondents oppose the inclusion of Arab political parties in the government. And according to a Haifa University Study, also cited by Ha’aretz, 74 % of Jewish youths in Israel think that Arabs are unclean. Of course, anti-Arab racism, Islamophobia, anti-goyism and other forms of xenophobia have always been rife in Israel. However, these morbid phenomena have of late assumed nearly Nazi proportions as the Israeli Jewish society continues to drift menacingly toward jingoism and fascism. A few months ago, an Israeli Jewish man invited an Arab tax driver from East Jerusalem to his home north of Tel Aviv for a cup of coffee . And when the Arab cabbie sat down to drink his coffee, the Jewish man and his brother brought in a big knife and murdered the innocent man in cold blood. synagogues or through the media. More to the point, it is imperative to remember that this racist indoctrination is by no means confined to the rabbles and the uneducated class. In truth, the entire Israeli society is based on racism. Racism is Israel’s modus operandi, and human and social equality is markedly incompatible with being Zionist. Recently, a few days before the ill-fated Annapolis conference in Maryland on 26 November, Israeli Foreign Minister Tzipi Livni proposed that Israel’s Arab citizens could be forced out of their ancestral homeland into a prospective Palestinian state. Livni, whose venomous views are likely to reflect the prevailing discourse in Israel, seems to harbor the same malice and ill-will toward Israel’s Arab citizens very much like Nazi Germany’s did toward its untermenschen. But unlike Hitler and his cohorts, who were brashly honest about what to do with Nazi Germany’s untermench (a German word meaning an inferior class of people), Livni is prevaricating about what she really wants. Some Israeli political leaders are franker and more honest about their respective mindsets than others. For example, Strategic Affairs Minister Avigdor Lieberman openly calls for the transfer of Arabs from Israel. (transfer is nothing short of a euphemism for genocide, at least a partial genocide). Do people in Europe and North America understand what is being implied by a Jewish solution? A few years ago, I pressed a Gush Emunim (block of the faithful) Zionist rabbi to explain his concept of the Jewish solution. The rabbi uttered three words: enslavement, expulsion or annihilation. It is absolutely wrong to think that these Nazi-minded people represent a small minority in Israel. In fact, I can dare say that they represent the majority trend among Israeli Jews. Today in Israel, if any politician wants to get elected or increase his popularity, he or she will have to demonstrate in ample manner his hatred of and sullen hostility toward the Palestinians and Islam. Indeed, as nefarious anti-Semitism was the ultimate certificate of good conduct that guaranteed passage through the Nazi hierarchy, hostility to Islam, Arabs and Palestinians is now the surest way to seize the hearts and minds of Jews in Israel. Finally, it is equally misleading to think that racism in Israel is a passing phenomenon. Last year, I asked a veteran Israeli journalist what would become of Israel and the world if and when the fanatics of Gush Emunim reached power in Israel, either through the ballot box or by way of a coup of some kind? I am invoking these ominous prospects because Gush Emunim and other messianic Zionist Jews are guided by a nearly genocidal doomsday ideology which teaches that the Jewish messiah or redeemer won’t appear until and unless there is violence and bloodshed on a uniquely large scale. Hence, it is conceivable that these religious fanatics, in cooperation with their secular fascist colleagues, would use Israel’s nuclear weapons to trigger the return of the Mashiah. Now is this the authentic Judaism that Moses taught? These are the same people who murder Palestinian civilians, including children, on a daily basis without the slightest feeling of guilt. These are the same people that bomb Palestinian homes, where women and children are asleep, from high altitudes without a whiff of compunction. And, Yes these are the same people who wouldn’t hesitate to embark on the unthinkable to effect and expedite their sick whims which can be summarized in one sound-bite: “hashmada” or annihilation. Nada and Lama, four and two. An Israeli soldier kills their father, farmer Baghat Abu Dakai with a single bullet yesterday. Cultural Genocide. The light unto all the nations lit into Susia villages olive trees. Meanwhile, Shimon Peres is afforded space in mainstream newspapers to pontificate on environmental issues and how Israel is "lighting" the way for the nations once again. Children as young as five years old in Gaza are forced to leave school and work 10 back-breaking hours a day to bring two shekels ($0.26) home, which now has no electricity, no clean water, no food, no fuel, no joy, and is constantly under the threat of sonic planes that fly from Israel to break the sound barrier over them, terrorizing everyone on the ground; making women miscarry and small children so traumatized that they become brain damaged. What gives Israel the right to do this? To starve 1.5 million Palestinians, half of whom are children? And yet...I wish the absurdity of it were truly so benign as a hullabaloo. If you were paying attention, you’d have heard the menace of ethnic cleansing and seen the malignancy of cowardice. George Bush made it clear that the United States will not pressure Israel into doing anything it doesn’t like. Plainly, the United States, the country that gives Israel $14,346 for every woman man and child in Israel, will not insist that Israel withdraw from the West Bank, which it has been occupying illegally since 1967. It will not insist that Israel stop detaining and torturing Palestinian men, women and children, leaving them to languish for years without charge or trial. The US, a country founded on the principle that all men are created equal, will not insist that Israel provide full rights under the law for non-Jews equal to that it accords for Jews. The US will continue to give Israel more money and weapons that it has ever given to any country and we will not even insist that Israel comply with one single UN Resolution (out of over 200 resolutions censuring Israel) or the Geneva Conventions, or any other tenet of international law. We will not require, in concurrence with our own laws, that this recipient of massive foreign aid do something to correct its abysmal human rights record. We will, however, in 2008, issue the first installment of a brand-spanking-new $30 billion aid package to Israel. Short Lived Happiness. Released political prisoners Mohammad and Eyad Dabaia in Jenin with their mother December 3. For teenager Mahmoud Radouan a different story. He was tortured. The self-proclaimed "light unto the nations" lights many a Palestinian on their way to dusty death. Luckily, the candles are not out yet for three kids they shot in Azzoun village, whose residents have been under siege in their houses, recipients of Israel terror since October. Hanukkah is the Jewish holiday of light that recounts the Talmudic story of the Maccabees’ victory over the armies of King Antiochus IV. The story symbolizes the triumph of good over evil and light over darkness. This year, the celebration of Hanukkah coincides with a slow-motion genocide the legions of Zionism are carrying out against nearly 1.5 million helpless human beings in the Gaza Strip. According to human rights organizations, Gazans are dying in significant numbers as Israel continues to bar them from accessing food and work. Scores of patients have also succumbed to their illnesses thanks to Israel’s refusal to allow these unfortunate people to travel abroad or reach the West Bank to seek proper medical care. This week, the Israeli Supreme Court, a mere rubber stamp in the hands of the occupation army, authorized further cuts of fuel supplies and electricity to Gaza. This, coupled with the sinister policy of denying Gazans access to fresh food, vaccines, and clean water, is already having a disastrous impact on innocent people whose only crime is that 23 months ago, they elected a government that Israel didn’t like. According to the Maan News Agency, hospitals in Gaza are already facing nightmarish conditions resulting from the fuel shortage. Muawiya Hassanin, Director of Emergency Medical Services in Gaza, was quoted as saying that the continued cutoff of fuel supplies to Gaza would cause the destruction of crucial vaccines and other essential medication supplies. The fuel Shortage is also impacting intensive care units, dialysis units, operating rooms and neonatal incubators. In addition to the callous blockade, the Israeli occupation army murders innocent Palestinian civilians on a daily basis. And to justify or at least extenuate these crimes, the Israeli army routinely concocts excuses, pretexts and lies which are readily parroted by a generally dishonest western media that refuses to call things by their real names. As an occupying power, Israel is morally and legally obliged under international law to meet the needs of the people of Gaza. Israel claims to have ended its occupation of the Gaza Strip. But this is a brash lie since the Israeli occupation army continues to control Gaza’s borders, land, air and sea. Even impoverished Gaza fishermen seeking to obtain food for their starving kids from the sea are routinely hounded and often killed by Israeli gunboats. In the West Bank, the same policy of murder and oppression reigns supreme despite all the artificial aura of hope and good will Israel and the West are trying to foster, particularly in the aftermath of the American-hosted conference in Annapolis, Maryland. Meanwhile, Israeli occupation troops continue, nearly every night, to storm Palestinian homes, usually in the quiet hours before dawn, terrorizing innocent men, women and children. They beat and humiliate fathers in full view of their wives and children and vandalize property before dragging youngsters all the way to the notorious Ketziot detention camp in the Negev desert in southern Israel. Israel already detains as many as 11,000 Palestinians, many without charge or trial. Indeed, numerous detainees have intimated to this journalist that they don’t really know why they are being incarcerated. Furthering abusing its authority as an occupying power, Israel often keeps inmates in prison months and even years after the expiration of their respective prison terms, apparently to further torment them and break, as much as possible, their mental sanity. And when a given prisoner is released, he is often rearrested three months later without any genuine reason, apart from the sick desire to disrupt his family life and keep him in a constant state of anxiety. Why does Israel indulge in all these obscenities against a thoroughly tormented people whose only “crime” is its enduring desire to be free? Do these sick minds really think that oppressing and humiliating helpless Palestinians give them a feeling of virility and manliness.? Is manliness measured by the extent to which a solider humiliates and brutalizes another human being? If so, then the Gestapo, SS and the Wehrmacht must have been the most virile and manly of all men!! Zionism not only has wreaked havoc and vengeance on a people that had nothing to do with the holocaust, but has also nearly completely destroyed the moral fabric of the Jewish people by morphing them from ordinary men and women with a special sensitivity to justice into jailers, oppressors, murderers, thieves, and liars. Judaism taught “thou shall not murder,” but murder has always been and continues to be Zionism’s modus operandi. Judaism taught “thou shall not steal,” but Zionism and theft are effectively two sides of the same coin, and Israel is the greatest kleptomaniac in the history of mankind. Judaism taught “thou shall not lie,” but Zionism lies as often as it breathes. Judaism says “don’t mistreat foreigners who are living in your land…Treat them as you would a fellow Israelite, and love them as you love yourselves,” but Zionism insists on viewing non-Jews as children of a lesser God. Don’t these rabbis who shout “starve them, kill them, destroy them” read and understand these exhortations? Or is their Hanukkah a Hanukkah of darkness? It is sad and lamentable that the state of Israel, the illegitimate daughter of Zionism, continues to walk in the path of inequity and evil, all under the rubric of protecting Jews and safeguarding their vital interests. But in so doing, Zionism is striping Judaism and Jews of morality and justice. And a Judaism without morality and justice, is a heartless and soulless Judaism. Now, compare this with what Israel is doing to the Palestinians in Gaza and the West Bank! "Today is the 60th anniversary of the UN vote which sought to partition historic Palestine into two states, one for the Jews, one for the Palestinians. It is a resolution that remains only half-implemented. Now there is a slender chance of completing the job - and surely, despite the thousand obstacles, the world has to grab it with both hands." Khalidi, Walid. Before Their Diaspora: A Photographic History of the Palestinians 1876-1948. Washington DC: Institute For Palestine Studies, 1991. "Partition was seen by the Palestinians as imposing unilateral and intolerable sacrifices on themselves. The reasons for their opposition were the same as in 1937, except that the UN partition plan gave the proposed Jewish state 50 percent more territory than the 1937 plan had. The area of the Jewish state according to the UN plan would actually be larger than that of the proposed Palestinian state (5,500 square miles as compared with 4,500 square miles) at a time when the Jews constituted no more than 35 percent of the population and owned less than 7 percent of the land. Within the proposed Jewish state, Jewish land ownership did not in fact exceed 600 square miles out of the total area of 5,500 square miles. Nearly all the citrus land (equally divided in ownership between Jews and Palestinians), 80 percent of the cereal land (entirely Palestinian-owned), and 40 percent of Palestinian industry would fall within the borders of the proposed Jewish state. Jaffa, the Palestinian state's major port on the Mediterranean, would be altogether cut off from its hinterland, and Gaza would lose its traditional links with the wheatlands of the Negev. Hundreds of villages would be separated from communal fields and pastures. The Palestinian state would lose direct access both to the Red Sea and to Syria. The economic union between the two states, on which partition had been postulated, was known beforehand to be impracticable. The patchwork of subunits into which partition would divide the country bore little relationship to the human and social realities on the ground. " An excellent op-ed appears in today's Los Angeles Times, written by third generation Palestinian refugee and Exeter professor, Ghada Ageel: 'Will Peace Cost Me My Home? "And it is fundamentally racist to believe that I would pose a threat to Israel if I were to move back to my family's village (which I would do if I were given the option). The notion of a Jewish state that must always retain a Jewish character -- so that people of other ethnicities can be barred from living in their ancestral homes and minorities groups are treated as second-class citizens -- is frighteningly similar to the apartheid state of South Africa, where different ethnic groups were treated unequally under law." "Today, the number of Palestinian refugees residing outside Palestine exceeds the number of Palestinians living in Occupied Palestinian Territory. Moreover, with the rights of Palestinian citizens inside Israel as well as internally displaced Palestinians still hanging in abeyance, the PLO will be unable to claim to legitimately sign onto an 'end of conflict' agreement that Israel wants. Instead, it is time to challenge Israel's ethnic desires and the concept of a 'Jewish state' rather than continuing to view Palestinians as a 'demographic threat' instead of individuals whose rights must be upheld for comprehensive peace to be achieved. Without so doing, the international community will have promoted the very racist ideals that it has long sought to eliminate." One state, two states, or twenty three mini-states with twenty two of them called Palestine, no matter how many or few states there are supposed to be and what they are called, fact is sovereign Israel's long term racist refusal to respect the Palestinian refugees' inalienable legal right to return to original homes and lands remains a core problem that needs to be resolved ASAP! True return- not more forced transfer and despair." Khalid Amayreh dares speaks the truth about Israeli bigotry in ways that secular America and any one who has visited a Holocaust museum might understand- and Israelis are trying to shut him up. America needs to hear what he has to say- and we need to be seriously supporting and working towards a Rights Based Solution where there is real freedom and respect for all the the people of historic Palestine. "Palestinian Refugees and Negotiations "
On 16 July 2007, President Bush called for the convening of an “international meeting” in order to push forward the Israeli-Palestinian peace process following almost seven years of Israel’s refusal to negotiate. It is expected that this conference will address the unresolved issues in previous Israeli-Palestinian negotiations, chief among which is the issue of the fate of millions of Palestinian refugees. This note aims to provide a history of the negotiations on the issue of Palestinian refugees and argues that the restoration of rights to Palestinian refugees must be a key component to any lasting agreement (1). "We must expel Arabs and take their places. "—David Ben Gurion, 1937, Ben Gurion and the Palestine Arabs, Oxford University Press, 1985. The U.N. Partition of Palestine (2) served as the visible catalyst of the flight of Palestinians from their homeland. Up until that time, Palestine’s Jewish population had been steadily increasing as Jewish immigration into Palestine was virtually unlimited by the British forces controlling Palestine. By 1947, it is estimated that Palestine had 1.9 million inhabitants; 31 percent of whom were Jewish (with the majority being recent immigrants) and the remainder Palestinian Arabs (Muslims and Christians). Once passed, the U.N. General Assembly resolution served as the “green light” for Jewish Zionist forces to begin their campaign of forcible expulsion of Palestinians from Palestine. The numbers of Palestinians who fled or were forced to flee have been the subject of much debate, with Israel and Zionist groups downplaying the numbers to as little as 350,000 while Palestinian sources indicate that upwards of 900,000 Palestinians fled during 1947-1949. U.N. sources estimate that 750,000 Palestinians fled during this period (amounting to 75 percent of the Muslim and Christian population of what became Israel) (3). Thousands of homes and hundreds of villages were also demolished, thereby erasing the presence of Palestinian Arabs who fled. A mere 150,000 Palestinian Arabs remained in what became Israel with thousands of them internally displaced from their homes (4). Palestinian refugees and internally displaced Palestinians (who hold Israeli citizenship) have never been able to return to their homes. The U.N. General Assembly quickly spoke to the issue of Palestinian refugees demanding that Palestinians be allowed to return to their homes in what became Israel. This resolution (U.N.G.A. 194 (III)) has been reaffirmed every year since December 1948. Though the visible catalyst of the creation of Palestinian refugees may have been the cloud of war (and in particular the U.N. Partition Plan), the real catalyst for these expulsions lay in the plans set out by Zionist strategists many years prior to the U.N. Partition Plan. For Zionists, the goal of a “Jewish state” in an area where the majority of people are not Jewish could only be achieved by two means: mass Jewish immigration coupled with mass expulsion of non-Jews (ie. Palestinian Arabs). (5) Viewed in this light, while the precise numbers of those Palestinians who fled Palestine are important, the central debate in resolving this issue should not focus on the numbers but on the motivation behind the expulsion. Unfortunately, to date, Palestinian-Israel negotiations have failed to address the reason behind the expulsion—the creation of a “Jewish state” in an area in which the people are not Jewish—and instead the various “solutions” proposed only aim to reinforce the reasons for the expulsion. Today, the number of Palestinian refugees registered with U.N.R.W.A. and their descendants number more than 4.4 million with unknown numbers of unregistered refugees. "There is no such thing as a Palestinian people... It is not as if we came and threw them out and took their country. They didn't exist. "—Golda Meir, statement to The Sunday Times, 15 June 1969. From 1948 until the start of the first Palestinian uprising, Israel and its supporters went to great lengths to deny the very existence of Palestinians. Famous among these denials was the above statement by former Israeli Prime Minister Golda Meir and books such as Joan Peters’ From Time Immemorial. The Palestinian uprising of 1987 and the continued presence of Palestinian citizens of Israel proved to Israelis that the Palestinians did indeed exist and that the “problem” could not be willed away. By 1993, with the start of the Oslo process, Palestinians (and hence Palestinian refugees) could no longer be ignored and indeed was soon placed on the table as one of the “permanent status issues” to be discussed by the PLO [Palestine Liberation Organization] and Israel. However, unlike the other permanent status issues—water, settlements, borders, security and Jerusalem—the issue of Palestinian refugees did not refer solely to actions surrounding Israel’s 1967 occupation but to the very essence of the conflict: the creation (and subsequent enlargement) of a “Jewish state” and the associated dispossession and denial of freedom required to carry out these plans. It is therefore unsurprising that while Israel agreed to find a “solution” to the plight of Palestinian refugees when negotiations finally began seven years later at Camp David in 2000, Israel refused to discuss the issue, determining instead that Israel would only discuss the “resettlement” of Palestinian refugees rather than their return (6). The Clinton Parameters of 2000 reinforced this position by setting three “options” for Palestinian refugees—resettlement, moving to the Palestinian state or limited return to Israel. This position was later adopted at talks at Taba in 2001 and focus remained on resettlement with limited “symbolic” return (up to 50,000 Palestinians, representing 1 percent of Palestinian refugees) to what is now Israel, in exchange for Palestinian recognition of Israel as a “Jewish state”(7). Despite the climate of negotiations, the parties focused solely on means of accommodating the refugees elsewhere rather than restoring their rights and challenging the validity of the concept of ethnic cleansing to make way for an exclusivist state. Instead, facing the dual dilemmas of occupation and dispossession, Palestinian negotiators opted to choose to address the former while accommodating the latter. Such accommodation was later demonstrated in the Arab League Initiative of March 2002, which while calling upon Israel to completely withdraw from all of the territory it occupied in 1967 also, for the first time, diluted the Palestinian demand for the implementation of the Right of Return. The Initiative provided for the, “Achievement of a just solution to the Palestinian refugee problem to be agreed upon in accordance with U.N. General Assembly Resolution 194.” By 2003, the demand was further diluted with the Geneva Initiative in which former Palestinian negotiators agreed that any Palestinian return to Israel would be at the “sole discretion” of Israel(8). It seems clear that an agreed, just, fair, and realistic framework for a solution to the Palestinian refugee issue as part of any final status agreement will need to be found through the establishment of a Palestinian state, and the settling of Palestinian refugees there, rather than in Israel (9). Although President Bush’s letter reflected an outward change in U.S. policy towards Palestinian refugees, the response from Palestinian negotiators was muted with greater condemnation placed on President Bush’s acceptance as legitimate Israeli large colonies in the West Bank. The muted response did not come as a surprise to many. Since the start of negotiations in 2000, the PLO’s main focus has been on the creation of a “Palestinian state” rather than on advocating the rights of Palestinian refugees and demanding that their right to return be implemented. Instead, with passing years and the expansion of Israeli colonies, a “trade-off” has been set into place: territory for refugees. As Annapolis approaches, Israeli negotiators have made their position clear. Most recently Israeli Foreign Minister Tzipi Livni announced that, “Just as Israel is the embodiment of the Jewish national movement and is the homeland of the Jews, so too must the Palestinian state be the embodiment of the Palestinian national movement and the homeland of the Palestinians.” This statement not only ignores Israel’s ethnic cleansing but implicitly demands that the Palestinians accept Israel’s racist actions and be content with the formation of a state on a mere fraction of their territory. In short, while Livni and Israel view as a concession the concept of a “greater Jewish state,” they have, in effect, demanded that Palestinians accept the notion of a “Jewish state” and thereby give up on the Right of Return. The negotiations between Israel and the Palestinians have revealed two major flaws in regards to the rights of Palestinian refugees: (1) the failure to recognize the desires of Palestinian refugees and (2) lack of adequate representation for Palestinian refugees. Regarding the former, proposed “solutions” to Palestinian refugees have failed to take into account the unique nature of Palestinian refugees. Unlike other refugee populations around the world who seek refuge in other countries, Palestinian refugees have overwhelmingly expressed a desire to return rather than be resettled. Yet, solutions have given greater weight to Israel’s inherently racist “demographic concerns” than the legitimate rights of Palestinian refugees. As a result, inadequate solutions have been proposed—all of which legitimatize Israel’s actions while diminishing Palestinian rights. Regarding the latter as mentioned above, Palestinian refugees—an issue that goes to the core of the conflict—were lumped together with the other issues surrounding—actions that pertain to Israel’s 1967 occupation. As a result, Palestinian negotiators, who live under Israeli military rule and whose main goal is to see an end to Israel’s military rule, have also been the voice for Palestinian refugees, despite the fact that they may have conflicting interests. In doing so, not only has the international community and Israel ignored the desires of Palestinian refugees, so too have Palestinian negotiators who instead appear to soften their demands for the implementation of the Right of Return in exchange for Israeli withdrawal from the West Bank and Gaza Strip. While this may ultimately lead to the creation of a “Palestinian state,” adopting the strategy—land for refugees—is not wise. Today, the number of Palestinian refugees residing outside Palestine exceeds the number of Palestinians living in Occupied Palestinian Territory. Moreover, with the rights of Palestinian citizens inside Israel as well as internally displaced Palestinians still hanging in abeyance, the PLO will be unable to claim to legitimately sign onto an “end of conflict” agreement that Israel wants. Instead, it is time to challenge Israel’s ethnic desires and the concept of a “Jewish state” rather than continuing to view Palestinians as a “demographic threat” instead of individuals whose rights must be upheld for comprehensive peace to be achieved. Without so doing, the international community will have promoted the very racist ideals that it has long sought to eliminate. Diana Buttu is a lawyer who resides in Ramallah and a former legal advisor to the PLO on refugees. This piece was written exclusively for The Palestine Center. 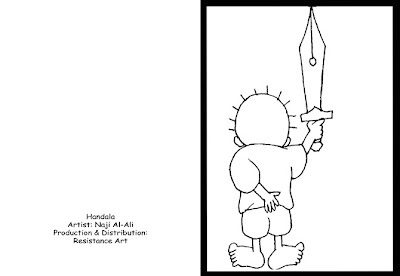 The above text may be used without permission but with proper attribution to The Palestine Center. This information brief does not necessarily reflect the views of The Jerusalem Fund. 2U.N. Resolution 181 passed overwhelmingly by the General Assembly but not the Security Council. 3Even prior to Israel’s declaration of statehood on 14 May 1948, an estimated 300,000 Palestinians had fled Palestine, debunking Israeli claims that Palestinian refugees fled at the orders of neighboring Arab countries as a result of the declaration of war against Israel. 4These Palestinians lived under Israeli military rule from 1948-1966, akin to the current restrictions imposed by Israel on the Palestinians of the West Bank. 5It cannot be ignored that the events of World War II and its aftermath (and in particular the Holocaust) served as a catalyst for the migration of Jews to Palestine. That said, plans for Jewish immigration were laid out well before World War II and the Holocaust. And though Israel’s supporters cite the Holocaust as a reason for having a “Jewish state,” it cannot be ignored that the creation of a state intended to provide refuge to Jews has created one of the largest and longest standing refugee populations. 6Rob Malley and Hussein Agha, “Camp David: The Tragedy of Errors,” New York Review of Books, Vol. 48, No. 13, 9 August 2001..
7The Moratinos “Non-Paper.” A copy can be found at http://www.jmcc.org/documents/docs.html. 8This position was further adopted by the “Geneva Initiative,” which provided that the return of Palestinians to what is now Israel would be at the “sole discretion” of Israel. See http://www.jmcc.org/documents/genevaagree.htm. 9A copy of the letter can be found at http://www.jmcc.org/documents/bushsharonlet.htm. Thank you for publishing Ghada Ageel's "Will peace cost me my home?" Thrilled to see the refugees recognized and attention paid to the inalienable right written into the Universal Declaration of Human Rights sixty years ago: 'Everyone has the right to leave any country, including his own, and return to his country.' As a daughter of a Palestinian immigrant to the US, I was privileged to attend California public schools, where our teachers taught what Ms. Ageel so aptly conveys: "Surely all modern conceptions of justice and equality must decry a system that places Jews above Palestinians." Any Mideast pact must give Palestinians the right to return home. Sixty years ago, my grandparents lived in the beautiful village of Beit Daras, a few kilometers north of Gaza. They were farmers and owned hundreds of acres of land. But in 1948, in the first Arab-Israeli war, many people lost their lives defending our village from the Zionist militias. In the end, with their crops and homes burning, the villagers fled. My family eventually made its way to what became the refugee camp of Khan Yunis in Gaza. We were hit hard by poverty, humiliation and disease. We became refugees, queuing for tents, food and assistance, while the state of Israel was established on the ruins of my family's property and on the ruins of hundreds of other Palestinian villages. Some people may tire of hearing such stories from the past. "Don't cry over spilled milk" is one of the first sayings I learned in English. But for me, the line between past and present is not so easily broken. I raise this story today because it remains profoundly relevant to the Middle East peace process -- and to help convey the deep-seated fears of Palestinian refugees that we will be asked to exonerate Israel for its actions and to relinquish our right to return home. That cannot be allowed to happen. All refugees have the right to return. This is an individual right, long recognized in international law, that cannot be negotiated away. Palestinian refugees -- and there are more than 4 million of us registered with the United Nations today -- hold this right no less than Kosovar or Rwandan or any other refugees. But the option should be open to us. If a refugee decides to return, he or she should not be hindered. Anything less would be unacceptable to Palestinians, two-thirds of whom are refugees. Those who choose not to return must be fairly compensated for their losses. My fear is that in the months ahead, enormous financial and political pressure may be brought against our fractured leadership to concede the rights of refugees. In 2000, Yasser Arafat was castigated internationally for his refusal to accept what was perversely termed a "generous offer" from then-Israeli Prime Minister Ehud Barak, even though it made no provision whatsoever for the return of refugees. However, Arafat was greeted as a hero by Palestinians for his principled unwillingness to sanctify ethnic cleansing. Seven years later, we will perhaps be confronted with another "generous offer" aiming to formalize our dispossession. Tragically, world powers have little stomach to battle Israel for what they view as bygone peccadilloes. Yet my ultimate destination is not Khan Yunis but Beit Daras. It is fundamentally unjust -- even all these years later -- that the world stands by and countenances the Israeli decision to expropriate my family's land. And it is fundamentally racist to believe that I would pose a threat to Israel if I were to move back to my family's village (which I would do if I were given the option). The notion of a Jewish state that must always retain a Jewish character -- so that people of other ethnicities can be barred from living in their ancestral homes and minorities groups are treated as second-class citizens -- is frighteningly similar to the apartheid state of South Africa, where different ethnic groups were treated unequally under law. Ghada Ageel is a third-generation Palestinian refugee. She grew up in the Khan Yunis refugee camp in Gaza and teaches Middle Eastern politics at the University of Exeter in Britain. Hence it is, that when the deed is done, when the work of darkness is perfect, then the world of darkness passes away like a pageantry in the clouds: the knocking at the gate is heard; and it makes known audibly that the reaction has commenced; the human has made its reflux upon the fiendish; the pulses of life are beginning to beat again; and the re-establishment of the goings-on of the world in which we live, first makes us profoundly sensible of the awful parenthesis that had suspended them. To the exiled and the occupied we say you shall return and you shall remain and we will prevail, for our cause is just We will put on our embroidered robes and kafiyehs in the sight of the world and celebrate together on the day of liberation the land of Palestine.